The Amazonia is the biggest rainforest in the world, located North of Brazil, and has been historically cut down, burned, and devastated in many ways. Landowners claim their local rights to do what they want within their territory (including the destruction of the Brazilian rainforest), local rural workers fight for the conservation of the rainforest and for their own human rights; then the situation needed the intervention of UN and International Environmental Law. So the conflict started as civil but turned to international. Brazilian government was supporting the landowners (in terms of development) until UN intervened in 1990’s, when a kind of international debate was initiated, then (recently) they started to concern about their rainforest. The analysis for this case will be centered on a region within the Amazonia called Par (shown in the map below encircled in yellow), where high levels of violence and deforestation have been reported. This map shows a region of the Brazilian Amazonia, a region within the Par province (Yellow area). This area has the most reported cases of conflict-related deaths, where local rural workers have been assassinated. A high level of deforestation is reported for this region as well. What we see on this map is: The red symbols indicate conflict-related deaths reported between 1964 and 1987 (the 2 biggest symbols represent approximately 80 cases each, the medium symbols represent approximately 40 cases each, and the small symbol represents approximately 20 cases). The violet symbols indicate conflict-related deaths reported between 1988 and 1999 (the 2 big symbols represent approximately 20 cases each, and the small symbols represent approximately 15 cases each). 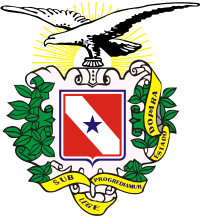 The light blue symbols is related to a different aspect of this conflict (illegal logging, tree burning, the indigenous tribes, and agricultural activity). 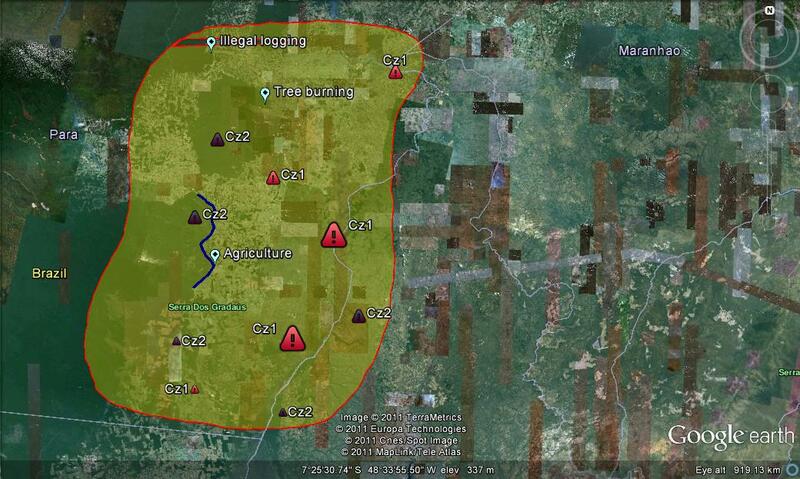 Within the yellow area, there is a blue line which represents an example of a clear border between the Amazon rainforest and cleared area for agriculture. 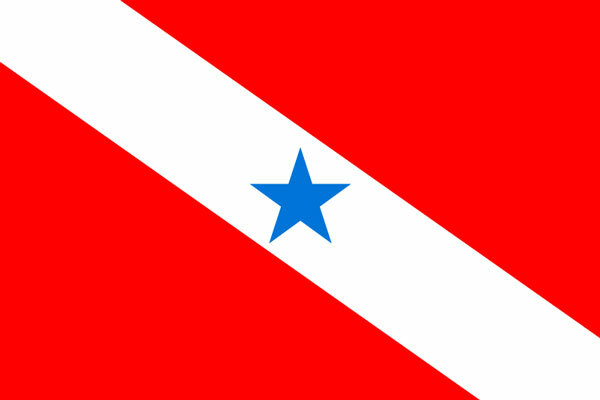 The location of the symbols (not the case of the picture overlay) represents the official location of what they represent (so it is not a random allocation). 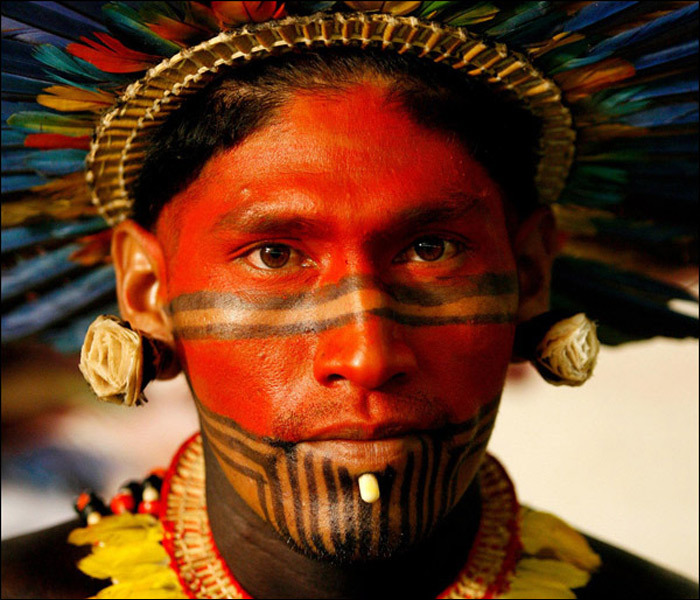 Ever since South America was “visited” by European colonizers (16th century), there have been many different problems regarding the destruction of Brazilian rainforest, related to human rights, environmental security, and loss of biodiversity (among others). How they invaded the natives lands, destructing the habitat for logging, mining and trading. Even after several centuries, these problems persisted. In 1964 the problem worsened, as 1681 rural workers and other involved in land use issues have been murdered. Since then until early 1990’s, local claims and problems were far from reaching a proper solution, when a convention took place in Rio de Janeiro (1992), the UN interfered, and the problem switched status as International Environmental Issue, so many principles have been stated. Although this sounds encouraging, this declaration lacks of binding force, so there is not big commitment for Brazilian landowners. This rainforest, as the main source of photosynthesis worldwide has been proposed as natural reserve, and some other reasonable and interesting solutions are available but need to be debated and strengthened. 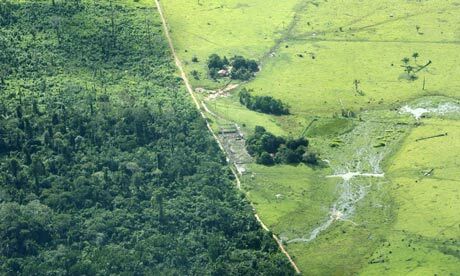 Cattle ranching is the leading cause of deforestation in the Brazilian Amazon. This has been the case since at least the 1970s: government figures attributed 38 percent of deforestation from 1966-1975 to large-scale cattle ranching. However, today the situation may be even worse. After so much trouble and death, Brazilian government has been debating on what part they should take on this issue. When analyzing benefits and costs, apparently they agreed on protecting the rainforest, and asking for financial support from developed countries. This idea has been approved, and deforestation activity has been decreasing since 2004 (Soares Filhoet al. 2010). Although official data show significant and continuous reduction in illegal deforestation, the problem hasn’t been solved, and several cases of intentional murders are still being reported. Further work needs to be done. A multinational Programme called Reducing Emissions from Deforestation and forest Degradation (REDD) in developing countries, launched in September 2008, brings together technical teams from around the world to help develop analyses and guidelines on issues such as measurement, reporting and verification (MRV) of carbon emissions and flows, ensuring that forests continue to provide multiple benefits for livelihoods and the environment, and supporting the engagement of Indigenous Peoples and Civil Society at all stages of the design and implementation of REDD+ strategies. 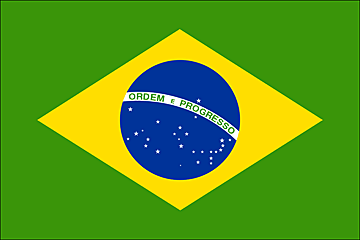 Several countries worldwide have been receiving support, but it is not the case of Brazil, because local indigeous people have refused the program for political and social reasons, so they have their own programmes, such as Amazon Cooperation Treaty Organization (ACTO). Since the end of 17th century to the present. Indigenous rural workers, local land owners, Brazilian government, and the UN. 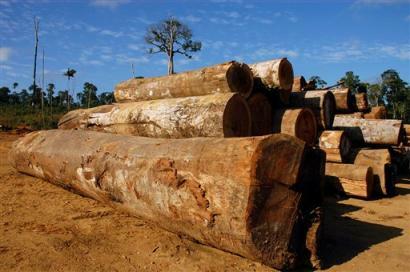 The type of environmental problem can be briefly described as "Extreme deforestation". The effects of destructing Brazilian Amazon are big but can be huge, if this rainforest is cut down (or burn), the main source of photosynthesis worldwide would be deleted, this means deleting one of the main sources for Oxygen, and as well increasing atmospheric CO2 ppm (plants and trees capture atmospheric CO2 for photosynthesis, so if they are not present any more, CO2 ppm increase). Oxygen decrease and carbon dioxide increase, affects Global Climate Change worsening the situation, depleting ozone layer, thus increasing UV levels, thus increasing temperature. This great rainforest is also the habitat for a big amount of species, and some of them are endangered, so any disturbance can lead them to vulnerability or extinction. The border created between the forest and agricultural lands is extremely divisable from the air, as shown in the below picture (the location of this specific area is indicated in the map shown previously). By some measures, forest fires in the Amazon are at near-record levels, according to analysis Brazilian satellite data by mongabay.com. A surge in soy and cattle prices may be contributing to an increase in deforestation since 2006. In 2006 environmentalists and the Brazilian government heralded a sharp fall in deforestation rates, the third consecutive annual decline after a peak in 2004. Forest loss in the 2006-2007 season was the lowest since record-keeping began in the late in 1970s. While the government tried to claim credit for the drop, analysts at the time said that commodity prices were a more likely driver of slow down: both cattle and soy prices had declined significantly over the previous months. Brazilian satellite data show a marked increase in the number of fires and deforestation in the region. The state of Para -- the heart of Brazil's booming agricultural frontier -- experienced a 50 percent or more increase in forest loss over the same period last year coupled with a large jump in burning: a 39-85 percent jump in the number of fires during the July-September burning period. 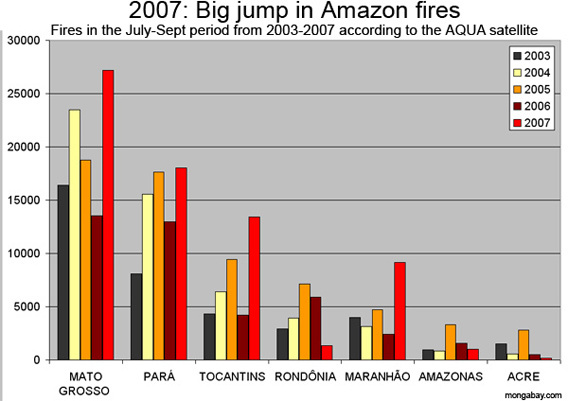 More broadly, the 50,729 fires recorded by the Terra satellite and 72,329 measured by the AQUA satellite across the Brazilian Amazon are the highest on record based on available data going back to 2003 (the NMODIS-01D satellite suggests 2005 burning was higher but still shows a 54 percent jump since 2006). Reports from the ground indicate that burning was indeed very bad in 2007. The actions causing climate change occur north of the populations affected in Par region in Northern Brazil. Brazilian deforestation is strongly correlated to the economic health of the country: the decline in deforestation from 1988-1991 nicely matched the economic slowdown during the same period, while the rocketing rate of deforestation from 1993-1998 paralleled Brazil's period of rapid economic growth. During lean times, ranchers and developers do not have the cash to rapidly expand their pasturelands and operations, while the government lacks funds to sponsor highways and colonization programs and grant tax breaks and subsidies to forest exploiters. Such favorable taxation policies, combined with government subsidized agriculture and colonization programs, encourage the destruction of the Amazon. The practice of low taxes on income derived from agriculture and tax rates that favor pasture over forest overvalues agriculture and pastureland and makes it profitable to convert natural forest for these purposes when it normally would not be so. More than 2000 indigenous rural workers and activists have been murdered and assesinations are still occurring. Intermediate to High. Since 1990's it has been decreasing, but it is possible for the conflict to go worse. 2200 civilians so far (and counting). After several years of conflict between land owners and rural workers/activists, more than 2000 activists were murdered. At this point, the Brazilian government interfered, in favor of land owners, giving them some political and financial support. As logging and tree burning continued, several groups of rural workers had to migrate in different directions (this dispersal was a big problem for them per se). Also, there exists a positive correlation and feedback between the soy price (and other products price) and local deforestation levels, where greater products price is converted in greater income (for local land owners). 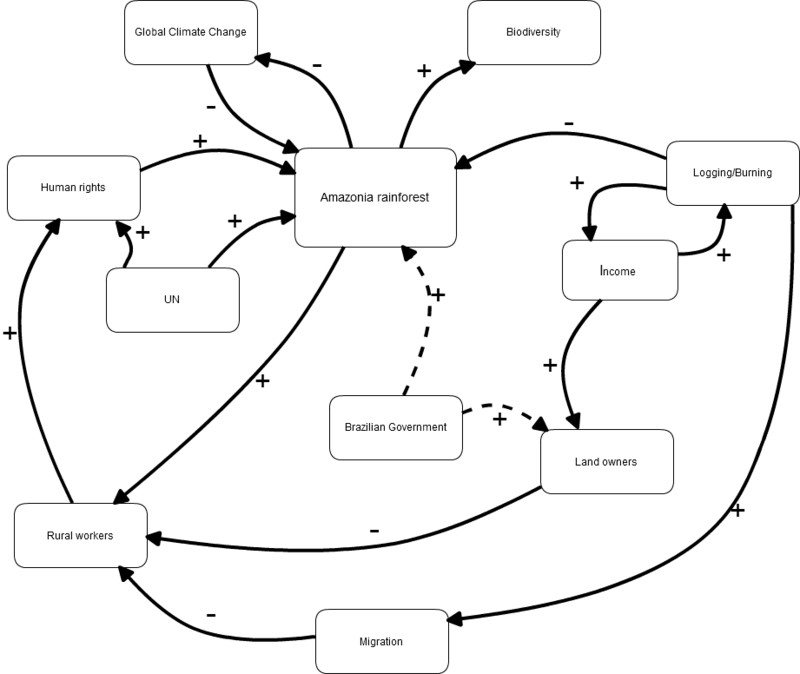 After several years of local conflict, the U.N. decided to intervene in the 90 s, and tried to define some principles for conserving the rainforest and protect human rights. When this happened, the Brazilian government was induced to restrict logging and tree burning activities, in order to protect the rainforest (so that is why the arrows from Brazilian government are dashed, basically because first they supported deforestation but then, they supported rainforest conservation). 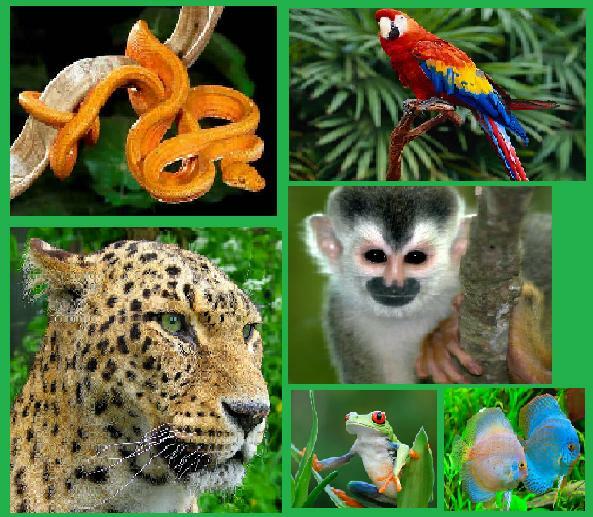 Finally, the rainforest is the habitat for many species and the main source of photosynthesis (Brazilian Amazonia is considered to be Earth's lung), trapping CO2 and producing O2 (diminishing the levels/effects of Global Climate Change). So deforestation increases (indirectly) Climate Change effects and diminishes Biodiversity (indirectly). So there is a local and a global dimension to the problem. 13. Level of Strategic Interest: Intermidiate to High. 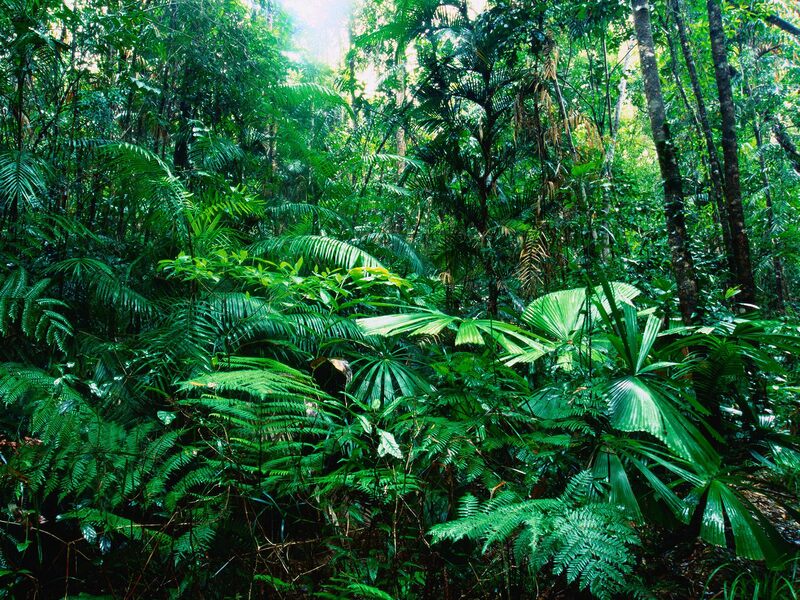 The Amazonia is the biggest rainforest worldwide, thus is the biggest CO2 sink. Since the deforestation rates started increasing rapidly, this issue became a global concern for avoiding the "Green House effect" or worsening of Climate Change. And that was the reason for the UN to interfere. And since the problem involves violent conflict, it is considered to be a sensitive case. The conflict is ongoing but so far, there have been more than 2000 assesinations reported, a significant portion of the rainforest has been depleted and turned into arable land. Simmons, C.S. 2005. Territorializing land conflict: Space, place, and contentious politics in the Brazilian Amazon. GeoJournal 64: 307–317. Shukla, J.; Nobre, C. & Sellers, P. 2008. Amazon Deforestation and Climate Change. Science 247: 1322-1325. Werth, D. & Avissar, R. 2002. 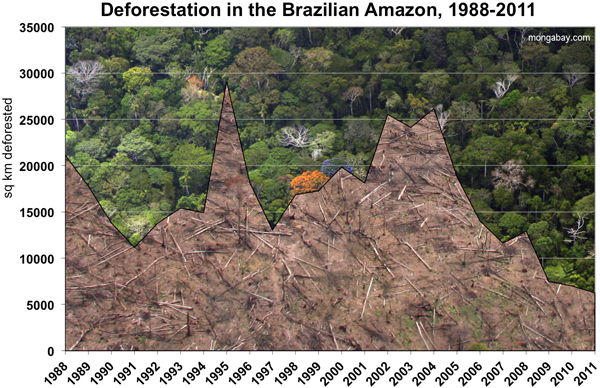 The local and global effects of Amazon deforestation. Journal of Geophysical research 107: 1-8. Reis, E. J. & Guzm n, R. M. 1992. An Econometric model of Amazon deforestation. Texto para discussao 265. Zeng, N., Dickinson, R. E. & Zeng, X. 1996. Climatic impact of Amazon deforestation - a mechanistic model study. American Meteorological Society 9. Rhett A. Butler, mongabay.com. 2011. Amazon rainforest loss in Brazil drops to lowest ever reported. Christensen, J.H., B. Hewitson, A. Busuioc, A. Chen, X. Gao, I. Held, R. Jones, R.K. Kolli, W.-T. Kwon, R. Laprise, V. Maga a Rueda, L.
Press, Cambridge, United Kingdom and New York, NY, USA. Bowman, M., Hissa, L., Silvestrini, R., & Maretti, C. 2010. Role of Brazilian Amazon protected areas in climate change mitigation. PNAS 107, (42). 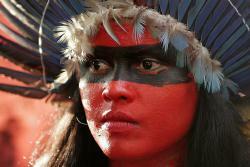 WWF article on "Call for justice on Amazon assasinations"